Stitches used are: Slipstitch (SlSt), Chain (Ch), Double Crochet (DC), Treble (Tr) and Treble 2 Together (Tr2Tog) Instructions for Tr2Tog are given later in the pattern. The size of the hat is on the generous side as it is a slouchy. 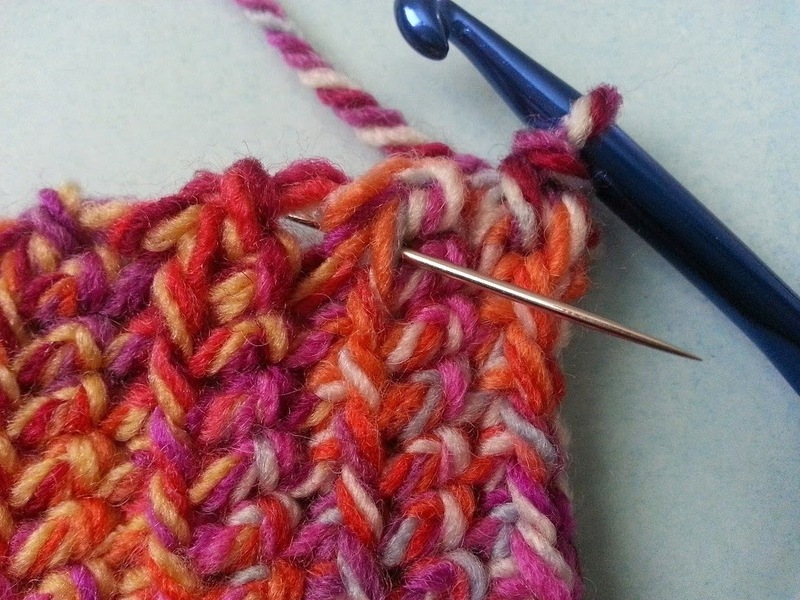 When you have made the 'ribbing' part of the hat, if it is much too big reduce the amount of rows of ribbing down to 60. The pattern should still work from here as the basic pattern is written in multiples of 10. Row 1 - Ch 10. Starting in second chain from hook, DC in each Ch across (9 DC made). Ch 1 and turn. 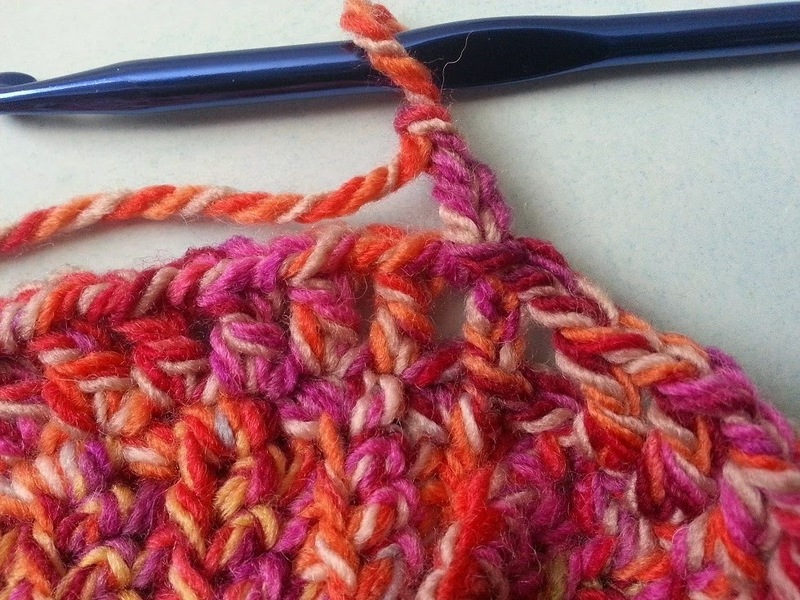 Row 70 - DC in each stitch across in Front Loops Only (9 DC made), Ch1 DO NOT TURN. You should now have 70 DC down the long edge with the last DC made in the very end chain loop from your initial foundation row. Bring the end of the long edge around and SlSt into the first DC. Row 1 - Ch 4 (counts as 1 Tr and 1 Ch 1 space) *1 Tr into the next Stitch, Ch 1* repeat around. Join with a SlSt into the third Ch of the Ch 4 and SlSt into the next Ch 1 space (see picture above). (70 Tr and Ch 1 spaces made). Row 5 - Ch 4, *1 Tr into the next Ch 1 space, Ch 1* repeat this 7 times, Tr2tog (This is made by: yarn over, put hook into the next Ch 1 space, yarn over, pull hook back through, yarn over and through 2 loops on your hook, yarn over and put your hook into the next Ch 1 space, yarn over and pull hook back through, yarn over and through 2 loops on your hook, yarn over and through all 3 loops on your hook). Ch 1, (*1 Tr into the next Ch 1 space, Ch1* repeat this 8 times, Tr2Tog, Ch 1) repeat the part in brackets around, so you make 8 Tr seperated by Ch 1 then Tr2Tog, Ch 1. Join with a SlSt into the third Ch of the Ch 4 at the start of the row and SlSt into the next Ch 1 space. (63 Tr and Ch 1 spaces made). Row 6 - Ch 4 *1 Tr into the next Ch 1 space, Ch 1* repeat this 6 times, Tr2Tog, Ch 1. (*1 Tr into the next Ch 1 space, Ch 1* repeat this 7 times, Tr2tog, Ch 1) repeat the part in brackets around. Join with a SlSt into the third Ch of the Ch 4 at the start of the row and SlSt into the next Ch 1 space. (56 Tr and Ch 1 spaces made). Row 7 - Ch 4, 1 Tr in next Ch 1 space, Tr2tog, Ch 1. (*1 Tr into the next Ch 1 space, Ch 1* repeat this twice, Tr2tog, Ch 1) repeat the part in brackets around. Join with a SlSt into the third Ch of the Ch 4 at the start of the row and SlSt into the next Ch 1 space. (42 Tr and Ch 1 spaces made). Row 8 - Ch 4, *1 Tr into the next Ch 1 space, Ch 1 * repeat this 3 times, Tr2tog, Ch 1. (*1 Tr into the next Ch 1 space, Ch 1* repeat this 4 times, Tr2Tog, Ch 1) repeat the part in brackets around. join with a SlSt into the third Ch of the Ch 4 at the start of the row and SlSt into the next Ch 1 space. (35 Tr and Ch 1 spaces made). Row 9 - Ch 4, *1 Tr into the next Ch 1 space, Ch 1* repeat this twice, Tr2Tog, Ch 1. (*1 Tr in next Ch 1 space, Ch 1* repeat this 3 times, Tr2Tog, Ch1) repeat the part in brackets around. Join with a SlSt into the third Ch of the Ch 4 at the start of the row and SlSt into the next Ch1 Space. (28 tr and Ch 1 spaces made). Row 10 - Ch 4, 1 Tr into the next Ch 1 space, Ch 1, Tr2tog, Ch 1. (*1 tr into the next Ch1 space, Ch 1* repeat this twice, Tr2Tog, Ch 1) repeat the part in brackets around. Join with a SlSt into the third Ch of the Ch 4 at the start of the row and SlSt into the next Ch1 Space. (21 Tr and Ch 1 spaces made). Row 12 - Ch 4, *Tr2Tog, Ch 1* repeat around, make 1 Tr in the last Ch 1 space. Join with a SlSt into the third Ch of the Ch 4 at the start of the row and SlSt into the next Ch1 Space. (8 Tr and Ch 1 spaces made). Row 13 - Ch 4, *Tr2Tog, Ch1* repeat this 3 times and made 1 Tr in the last Ch1 space. Join with a SlSt into the third Ch of the Ch 4 at the start of the row and SlSt into the next Ch1 Space.. 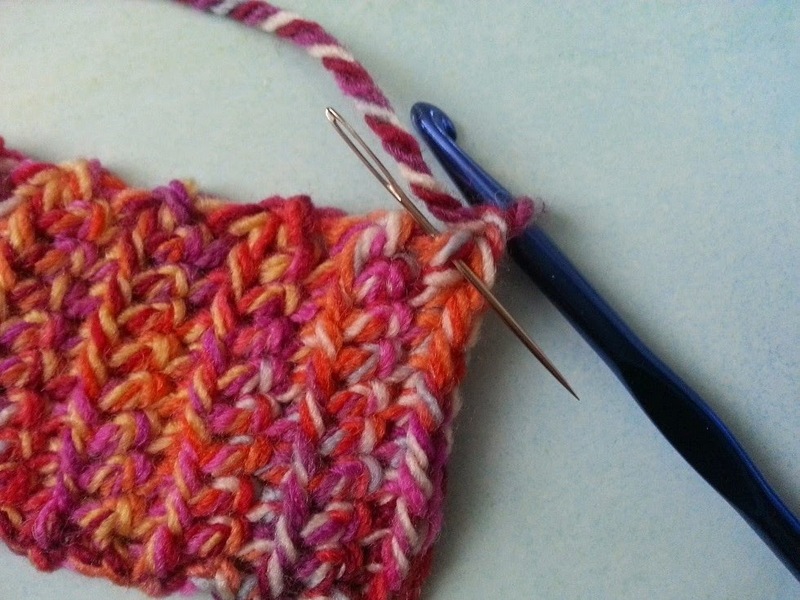 The gap at the top of the hat should now be very small so fasten off your yarn and with a darning needle weave the tail end between the ch1 spaces to close the gap. If your gap is too big to do this make 1 last round of Tr2Tog before you fasten off. 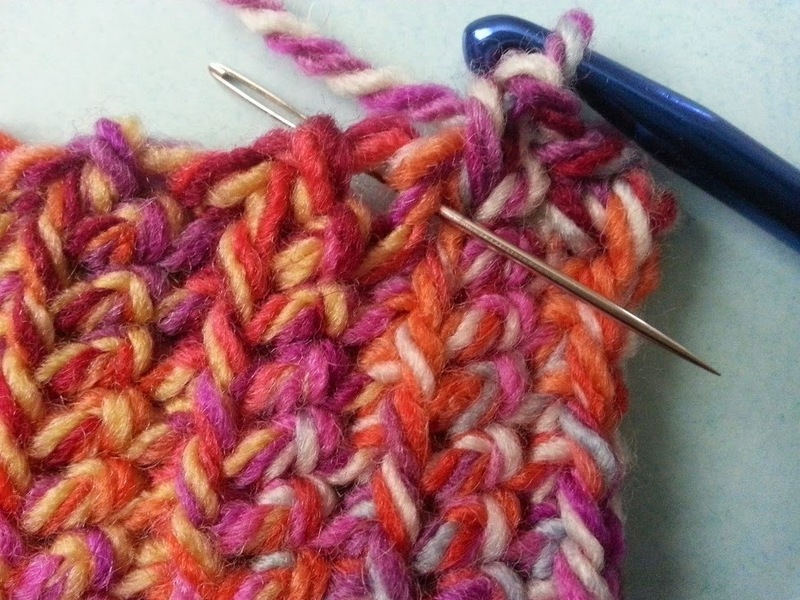 Sew up the short edge of your 'ribbing' section. 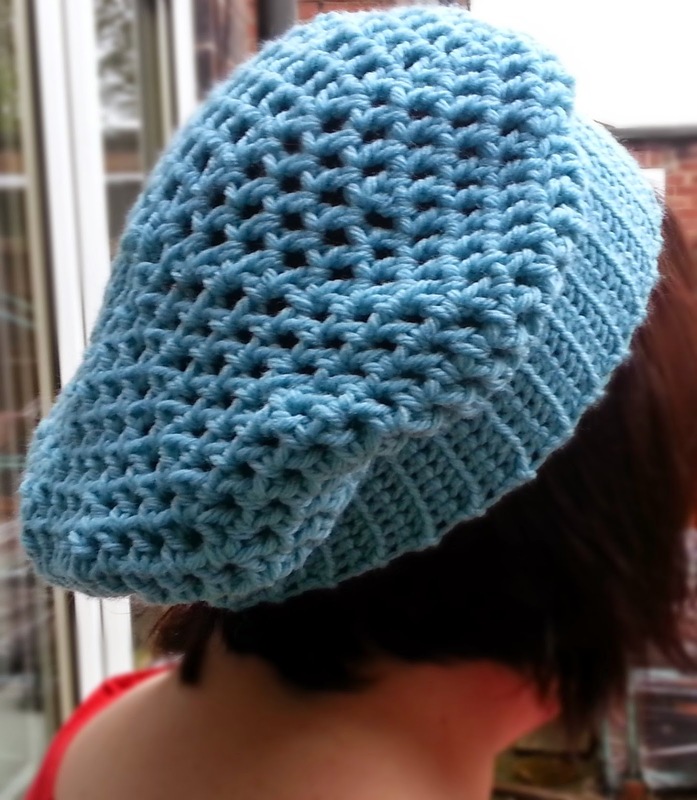 There you have it, one slouchy hat of your very own! Thank you so much for choosing this pattern, please do leave me a comment if there are any errors with the pattern or if you need any help with it. Brilliant, can't wait to give it a go. I am trying out this pattern today. It's been a while since I've crocheted anything and I think that this will be perfect to start with.